I wasn’t quite sure what to expect when going into GJ-bu, but I was pleasantly surprised with what I was given. 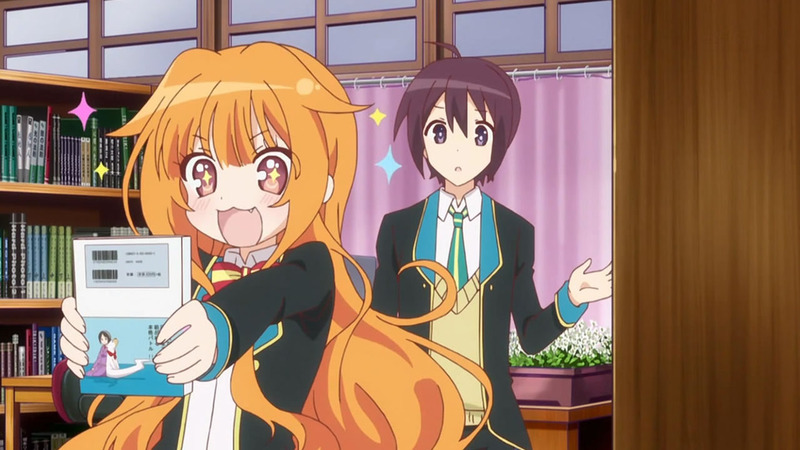 Great animation, an interesting mishmash of characters, and some genuinely funny moments make this harem turned sketch comedy a satisfying watch. I personally don’t like sketch comedy all that much because a lot of times it can feel staged and doesn’t allow for the characters to grow out of the mold that they are given. While the lingering caution stayed with me as I watched GJ-bu, I still find myself wanting to watch more. This show is all about the titular club, GJ-bu (literally Good Job Club), and the random antics that ensue. 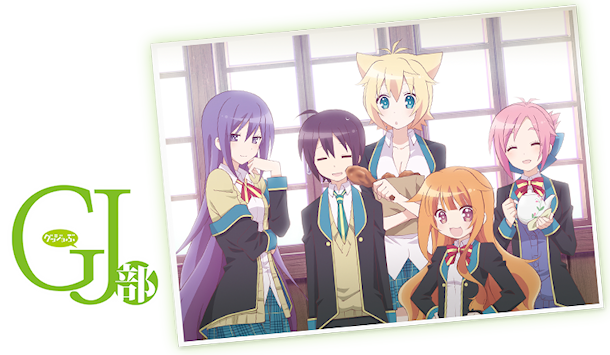 As seen in other anime like the “Cultural Research Club” in Kokoro Connect or the “Far Eastern Magic Society” from Chuunibyou, this club doesn’t really seem to do much aside from just hang out. The episode literally opens up with the main character, Kyouya Shinomiya, asking what the club president “why’s our club like this?” I personally have no complaints. I was quite pleased with the diverse cast of likable characters. In addition to our main man Kyouya, who plays the straight-man for most of the jokes, we have the assertive president Mao Amatsuka, the gentle Megumi Amatsuka, the savant Shion Sumeragi, and the carnivorous Kirara Bernstein. These contrasting personalities allow a lot of room humorous encounters to occur and they’re all generally likable. Even if Mao’s character is a little overbearing (only a tiny bit), I must admit that it’s pretty cute how she dislikes shoujo manga because of all the kissing involved. Other mundane yet interesting scenarios arise throughout the episodes in the form of sketches, such as Kyouya helping Mao change a light bulb, Shion learning how to make instant noodles, and a spider that looks to real for its own good. In Yuru Yuri, Dogakobo censored the cockroaches. Why couldn’t they do it here for the spider too?! 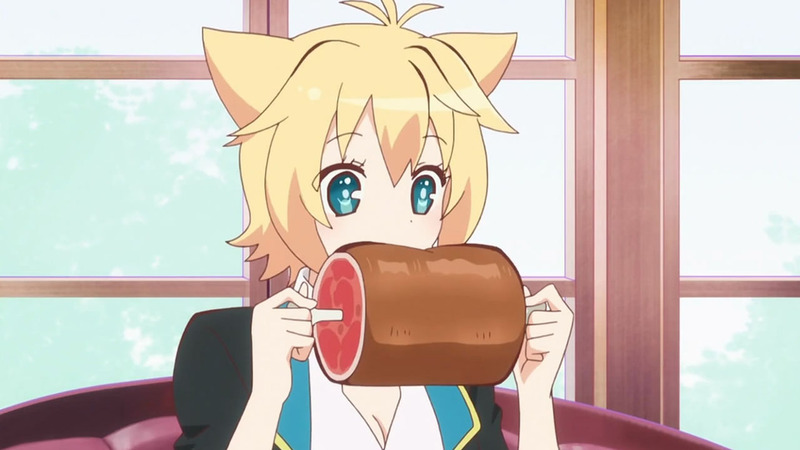 I hate spiders… We also watch Kirara, my personal favorite character so far, eat a lot of meat throughout the episode. From her speech (and last name), I think we can assume she’s a foreign exchange student of some sort which is awesome. The animation in GJ-bu looks pretty amazing. The colors are nice and vibrant, and I really like how the characters are drawn. The school uniforms in particular are awesome, and each of the characters has his or her own personal variation of the uniform, which is a nice touch. They’re reminiscent of the uniforms from Baka to Test, but I think these look a little cooler personally. The opening song is also one of the most unconventional, lyrics-wise, that I’ve ever heard. Just listen to it, and you’ll see what I mean. I like it, though. The ending song is a little more normal, but only features two of the girls! This leads me to believe that may feature different characters in the ending in future episodes. Both the ending and opening songs are performed by the seiyuu, which is always nice. While the BGM may be few and far between, the chiptune-ness adds a welcome feeling of quirkiness to the environment. I must admit, I was very skeptical when I first heard of the concept for this series. Sketch comedy is definitely not my thing, and while I have a few reservations about this series still, I enjoyed watching this first episode (save for the arachnids). If you need a breather from anything serious, GJ-bu is sure to provide you with some nonsensical fun.